In the past, every gas water heater had a standing pilot, which is a small flame that has to be constantly burning for the water heater to work. When the temperature of the water falls below the preset value, the gas valve switches on gas to the burner, and the pilot ignites it. The trouble with standing pilots—and one reason they are gradually being replaced by electronic ignitors—is that they go out. It doesn't take much; a strong draft or condensation in a humid basement can do it. The pilot is less likely to go out if it is sealed in an enclosure, but it will if the gas gets turned off for some reason. 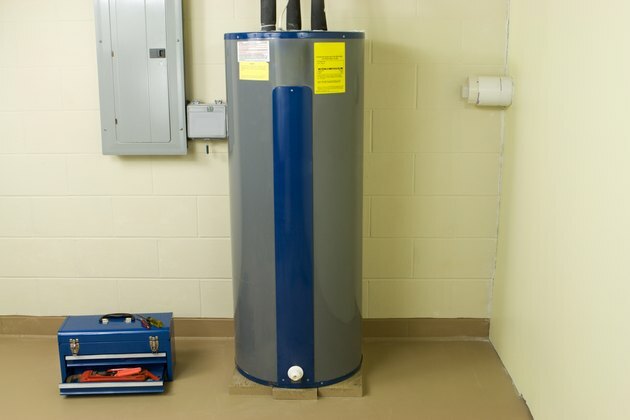 If your water heater has a standing pilot, you need to know how to relight it. The procedure varies slightly depending on whether the water heater has a piezoelectric spark ignitor for the pilot or not. The concept behind a piezoelectric ignitor is simple. Inside the ignitor casing are a quartz crystal and a spring-loaded metal hammer. When you press the ignition button, the hammer strikes the crystal, which produces a spark, then it resets. Piezoelectric ignitors are reliable and hardly ever wear out. If your water heater has one, you'll see a retractable red push-button near the gas valve on the front of the unit near the floor. Water heaters that have these ignitors usually have sealed pilot enclosures. When you press the button, look into the glass on the front of the enclosure, and you'll see the spark. Start by checking the inline gas valve to make sure it's on. If so, the valve handle will be parallel to the gas pipe. Turn the knob on the gas control on the water heater to the Off position, wait a minute or two for gas to clear out of the burners, then turn it to Pilot. Push in this knob and hold it while you press the spark ignitor button repeatedly or hold a long-handled lighter to the pilot orifice. Eventually, the small blue pilot flame should start burning. Keep the control know depressed for about 20 seconds, then release it and turn it to the On position. Verify that the flame continues to burn. If everything is working well, the pilot flame should be mostly blue and about an inch in length. If it's primarily yellow and sputters rather than burning steadily, the pilot tube needs cleaning. You can usually do this by unscrewing the pilot tube with a wrench and blowing compressed air through it, using an aerosol can. In some cases, you may have to remove the pilot tube completely and clear the orifice with a needle to remove obstacles. If the flame burns brightly and steadily, but it goes out as soon as you release the control knob, the thermocouple may need to be adjusted or replaced. Locate the thermocouple probe, which is near the pilot orifice, and move it a little closer. If that doesn't work, you may have to replace the thermocouple, but it's best to test it first, using a voltmeter.